Award-winning young Icelandic musician Ólafur Arnalds (celebrated composer of the score for TV series Broadchurch) has always loved the piano music of Frédéric Chopin, but had grown weary of the uniform and standardized perfection of recordings. "There has been no re-invention of the way Chopin's music has been presented since recording began, and I was longing for someone to come along and try something different. And one day, on a long flight to London, I thought: why don't I do it myself?" 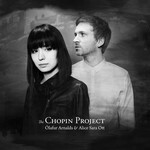 And thus, in partnership with the acclaimed German-Japanese pianist Alice Sara Ott, THE CHOPIN PROJECT was born. In order to achieve his aim, Arnalds developed an intimate, fragile and often charmingly imperfect sound using old/unusual/altered pianos captured on vintage recording equipment. He also employed various mixing techniques to re-enforce feelings of solitude or loneliness, and to create dreamlike ambient soundscapes. He wants the listener to feel so close to the performer that he or she can hear each breath, or fragile touch of the keys. Ott was instantly hooked by the project. "I love playing on out-of-tune bar pianos and, in my opinion, Chopin s music fits very well to those circumstances," she says. "He wrote for intimate spaces, for living rooms, and he loved to improvise and improvisation flourishes in these kind of venues, where lots of things are happening, and the performer can respond to them." At the start of their project, Arnalds and Ott went piano hunting in Reykjavik, and found instruments with lots of personality . Some of them were prepared with felt to create otherworldly effects. Arnalds then recorded the pianist using vintage equipment, creating a very close-up, intimate setting for her performances. Sometimes there are creaks, breaths, jangling piano strings, rustles of paper in other words, the sounds of real life which are usually removed from Chopin recordings. The result after studio mixing - is a textured, multi-layered musical experience unlike any other.